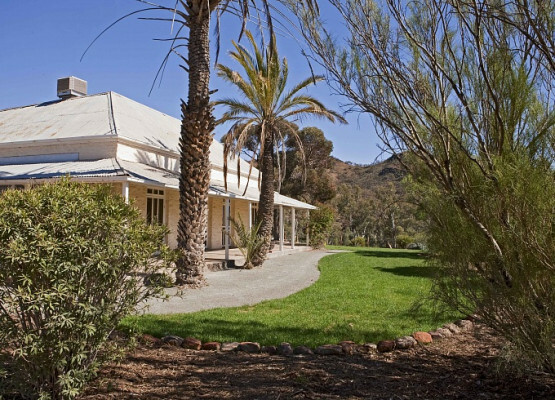 This 1850's home on the outback range is pure Aussie opulence. Arkaba is set on 60,000 acres of ancient landscape, molded by geographical activity and conservation. 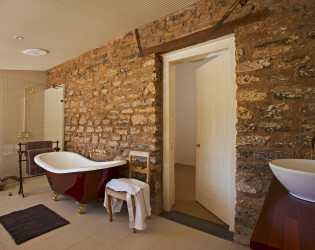 Totally takeover the 5 en-suite bedrooms, modeled after the home's pioneering past. Luxe touches combined with the lush landscape make for an unforgettable event locale. 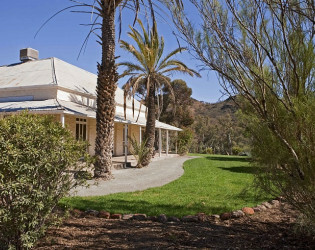 Dating back to the 1850s, Arkaba Homestead has been tastefully restored in tune with the property's pioneering history. 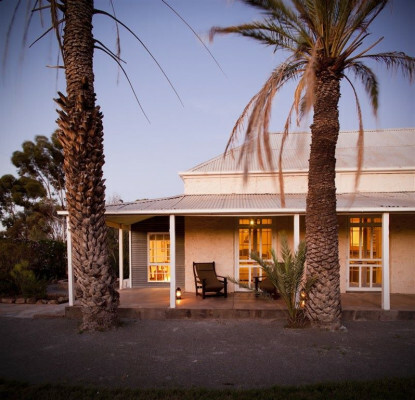 With just five rooms the homestead is an oasis of comfort and style amidst a harsh and rugged landscape, where guests enjoy a taste of classic Australian country hospitality. 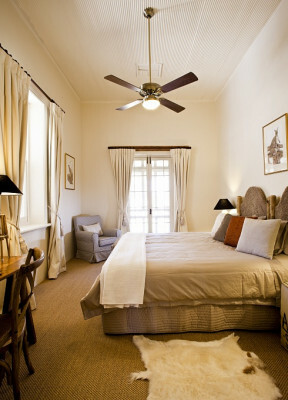 Each bedroom has its own ensuite bathroom and opens out onto a shaded verandah with individual views of the surrounding ranges. With decor by wildlife artist, Rosie Woodford-Ganf - think bedheads fashioned from recycled fence posts and fleeces, curtains tied back by gumnut tassles, lights perched on explorers' tripod theodolites - the guestrooms retain a sense of history and place. A comfortable library with deep leather armchairs and a large stone fireplace provides some seclusion for enjoying a quiet drink and a good book, while dinner is hosted on the terrace overlooking the ranges. In the heat of summer, the swimming pool overlooking the Arkaba Creek is a welcome retreat after a morning or day spent exploring the bush. Your hosts will ensure a friendly and personal level of attention that is typically 'down to earth' but does not lose sight of the attention to the small details that are so important in delivering an outstanding outback experience. The real luxury at Arkaba comes in sharing this spectacular conservancy with just a handful of other guests. 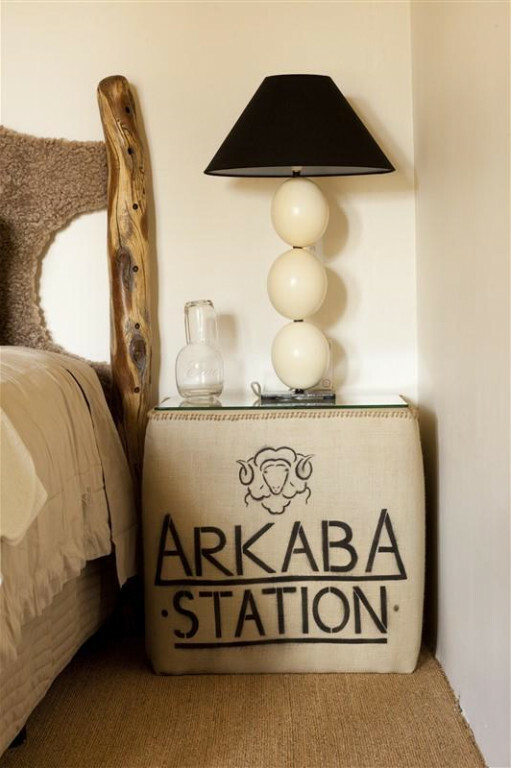 Arkaba Homestead needs to be booked exclusively for an event, with a minimum stay of 2 nights in 5 Guestrooms. 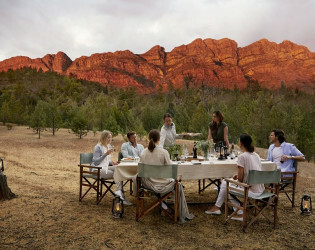 Included in this rate is accommodation for up to 10 guests in the homestead, all meals and beverages from a select open bar (a selection of Australian wines, sparkling and beer), daily guided wilderness activities (if applicable) as well as set up and pack down costs for the event. Any decorative elements, photographers, celebrants, caterers etc. will be additional. Arkaba is open year round. 5 Homestead Guestrooms with ensuite bathrooms that open out onto a shaded verandah with individual views of the surrounding ranges. 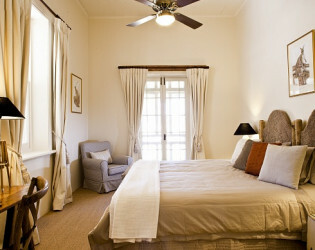 Four bedrooms are located in the homestead, while the Coachman's Cottage in the corner of the garden provides a fifth guestroom. The rooms are air conditioned and have been designed with the homestead's heritage in mind, a mix of king and twin beds have premium mattresses, organic cotton sheets and a choice of pillows to ensure a great night's sleep. With no telephones, televisions, minibars or the typical features of a hotel room to distract, the focus is on the experience and one of the most beautiful properties in Australia. An ancient landscape moulded by hundreds of years of geological activity, the Flinders Ranges offers some of Australia's most spectacular outback scenery. Arkaba's 60,000 acre private conservancy is home to a wondrous variety of bird and wildlife and a remarkable conservation story. 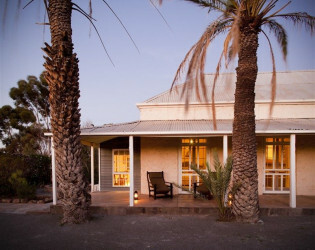 Guests enjoy the five bedroom 1850's homestead and private guiding while a few 'Wild Bush Luxury' touches ensure comfort, style and a truly memorable outback experience. 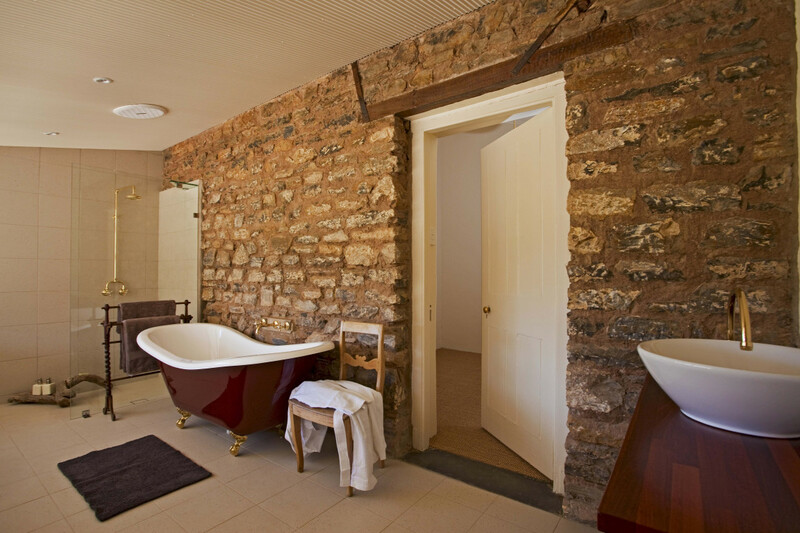 Dating back to the 1850s, Arkaba Homestead's 5 ensuite bedrooms have been tastefully restored in tune with the property's pioneering history. With Wild Bush Luxury's understated Australian style, the homstead pays homage to this rich pastoral and exploration heritage in a style that is both rustically chic and utterly exclusive. 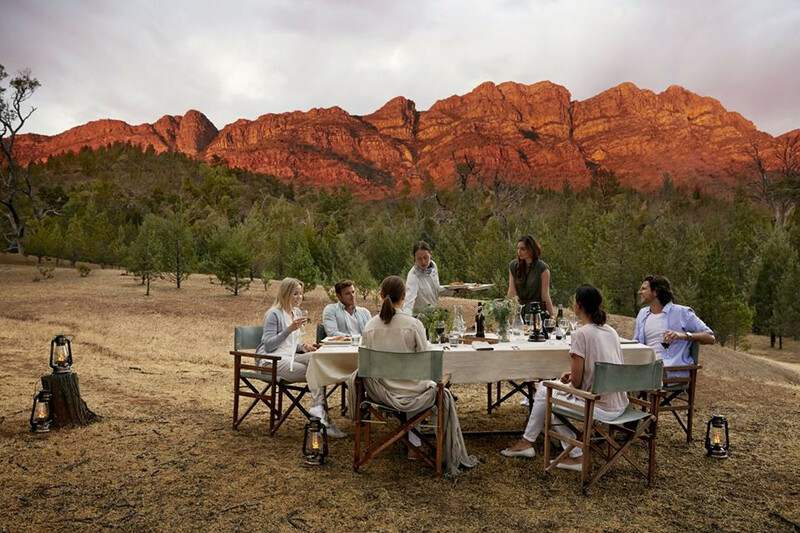 Arkaba’s true luxury comes in the fact that its 60,000 acres are shared by just 10 guests, taking the definition of exclusivity to a new level in Australia. 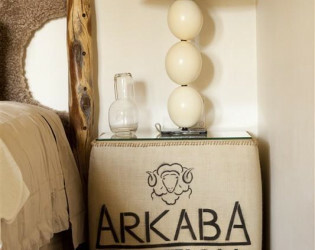 Nestled amongst the ancient landscape of the Flinders Ranges, Arkaba is a genuine blend of conservation and tourism. South Australia is one of Australia's great culinary stories: - its soils and clean air providing the key natural parameters for fresh and innovative produce. Arkaba has adopted a 'buy local' principle and the head chef uses the very best of South Australia's produce to craft the food program with a few native elements to add a unique intrigue and interest. A purely South Australian wine cellar has been selected to showcase a cross-section of wine growing regions with the grape varieties for which they are best known. The bar is completely open and the chef will adapt very specifically to guest tastes and needs. Dining around an old wool classing table on the outdoor terrace with the ever-changing light and sounds of the bush all around is a special and uniquely Australian experience. A firepit in the corner of the garden provides a great spot to retire to after dinner with a glass of wine or port to watch the stars appear over this ancient landscape.